As always, it is a pleasure to be here among so many who value the rewards of scholarship, whose life work is in the passionate pursuit of educational, intellectual and creative achievement at the highest levels. We come together today for the fourth consecutive year under the Hong Kong Scholarship for Excellence Scheme. 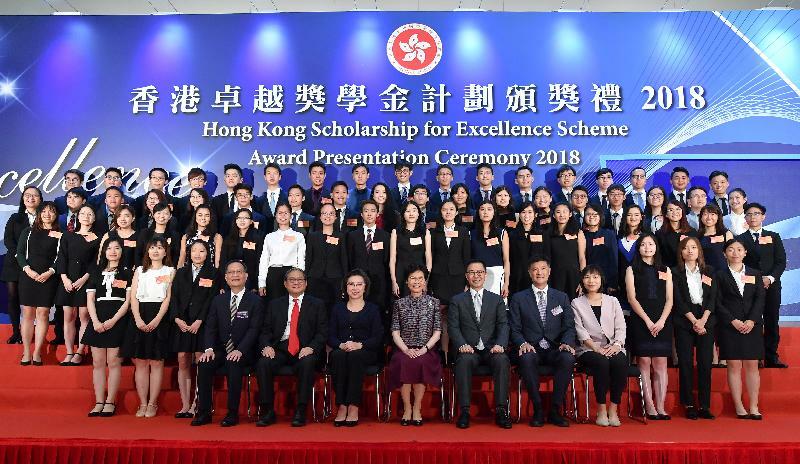 Counting this year's award-winners, more than 360 students have been named Hong Kong Scholars since the Scheme's inception and given the priceless gift of studying at acclaimed universities all over the world. Given its resounding success, I am pleased to say that the Scheme, initially started as a pilot with time-limited funding, will become a permanent feature in the Government's effort to nurture young people starting from the 2019/20 academic year. 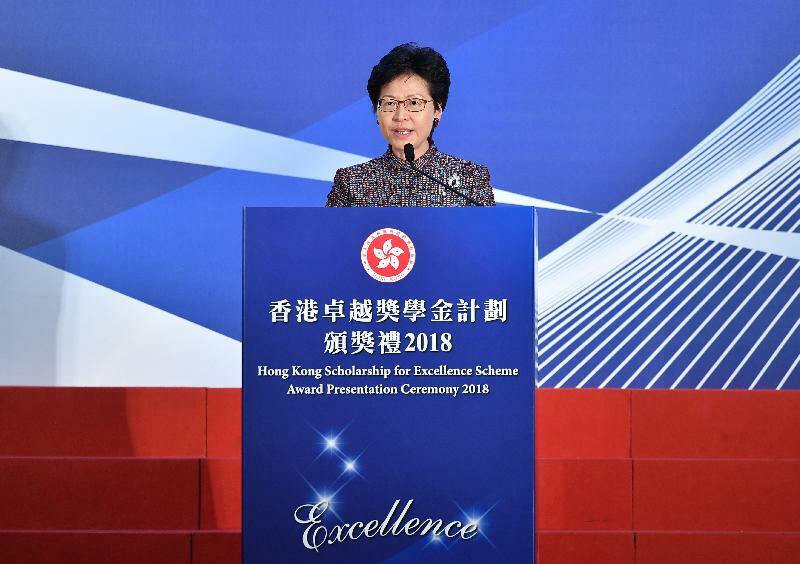 This underlines the success of the Scheme, which in no small part is due to the achievements of the previous cohorts of scholars, many of whom I have met in Hong Kong or abroad. This afternoon, however, let us focus on this year's extraordinary students. Among some 800 applications, all are high achievers and 83 were ultimately chosen. Fifty-eight of you are about to begin your undergraduate studies. Another 25 are destined for postgraduate programmes. All will be studying at renowned international universities. I am very pleased to know that, for the first time, we have a scholar going to a French institution. Like everyone else here today, I take pride in your determined efforts and outstanding academic results. My congratulations to each and every one of you. That said, let me add this essential caveat. While you should cherish your singular achievements, and all those who have helped you realise them, don't lose sight of the larger reality: your hard-won scholarship is not an end but merely a beginning. There will be more studies, more work, more decisions on the long and winding road to realising your potential. Eventually, there will be a career – likely more than one – as you build your life, find your places as valuable pillars of society. This is indeed one of the main reasons behind the launching of this Government Scholarship Scheme in 2014. If Hong Kong is to maintain and retain a prosperous international economy and a rewarding community in which to live and work, we need a younger generation like you. With that in mind, I must say I'm impressed by the diversified interests and talents of this year's scholarship winners. That's evident in the wide spectrum of disciplines you will be pursuing in the coming years. They range from mathematics and the natural sciences to computing and engineering, the social sciences, business, finance and economics, law, medicine and culture too. They include, as well, music and fine arts, along with disciplines not available in Hong Kong, such as drama therapy and archaeology. That diversity, ladies and gentlemen, reflects well on the passions, pursuits and vibrancy of this year's scholarship awardees. And it can only make Hong Kong an even more splendid place in which to live, love and work in. For that, my thanks to the Hong Kong Scholarship for Excellence Scheme's Steering Committee, particulaly its Chairman, Dr Victor Fung. My thanks, as well, to the interview panel members and mentors of the scholars for their substantial commitment and contributions. Your efforts, your guidance and generosity, have led to another fruitful and rewarding year. I must also thank the parents, teachers and principals of our scholarship winners. Day after day, year after year, you have helped nurture Hong Kong's next generation of achievers, creators and leaders. You should be proud of your sacrifices, your accomplishments and the future you have helped make possible. Last September, during my visit to London, I met some of our young scholars studying in the United Kingdom. They told me about their dreams, as well as their aspirations to contribute to Hong Kong after graduating. That was certainly gratifying for me personally. I look forward to meeting the scholars this year in the future, either in Hong Kong or in your places of study, and listening to your story. For now, I will congratulate you again and wish you all the best in your endeavours.